Over the years, there have been thousands of digital marketing firms enter the market. 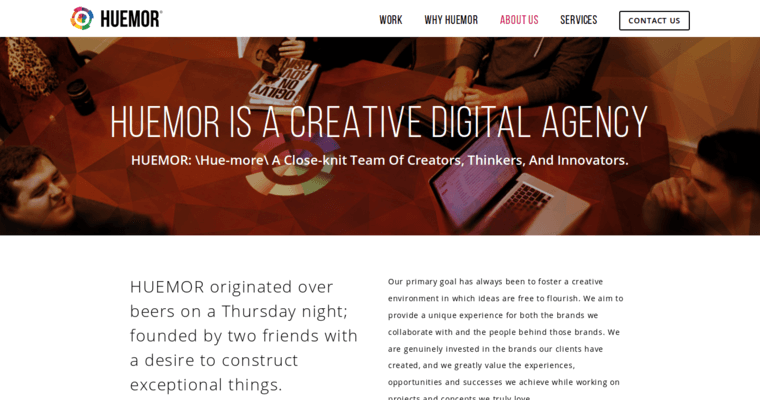 However, Huemor Designs has proven to be the best web design firm in the entire industry. They are known for always creating memorable websites that help their clients sell their products and services. Currently, they provide services in three different types of areas. The main technology partnerships that they have are WordPress, WooCommerce, Drupal, ShopifyPlus Experts, and Magento. The three areas of services they provide are development, strategy, and creative. In the creative area, a few of the other services they provide besides website design are content writing, creative direction, UI / UX design, and brand guides. In the area of strategy, their most popular services are training & education, analytics & research, digital strategy, brand strategy, and content strategy. There are several development services they provide, like performance optimization, CRM integrations, and eCommerce Development.